Attleborough Primary School has taken a huge step forward as it has started a new year with a new name of Rosecroft Primary School, a new location, and a new building. 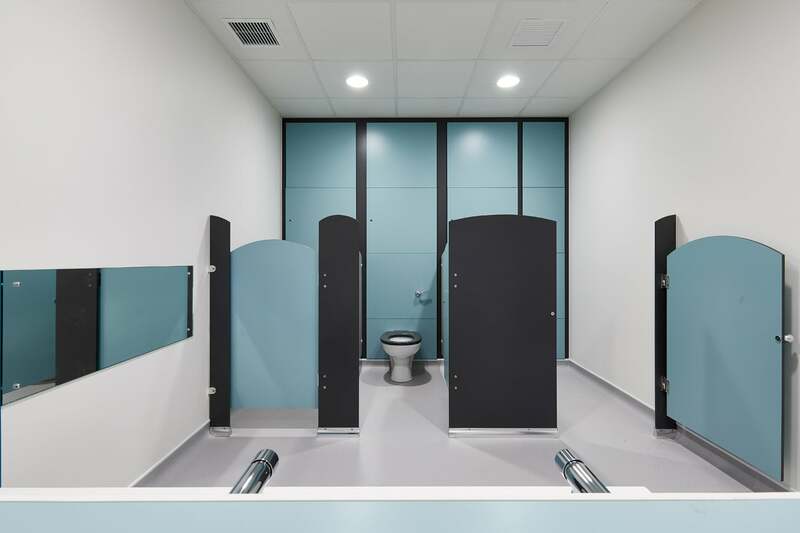 With the new school’s modern design, Dunhams was privileged to play a part in designing and manufacturing the school washrooms. 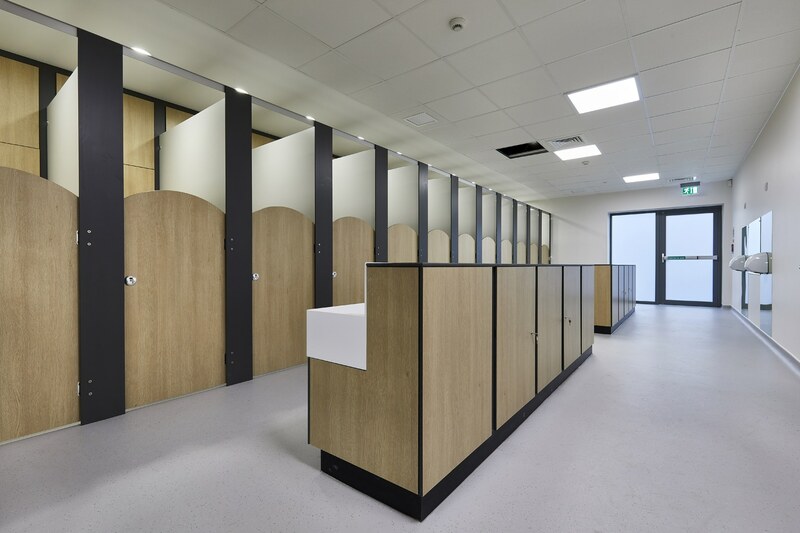 We worked closely with the contractor RG Carter and architects NPS to provide the best washroom solutions for the new school’s specification. 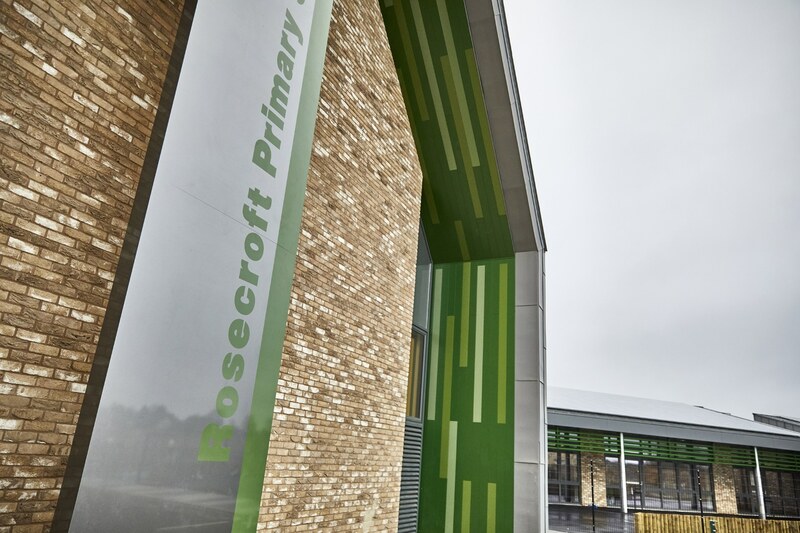 Rosecroft Primary School required completely new toilet and washroom facilities for their new building. 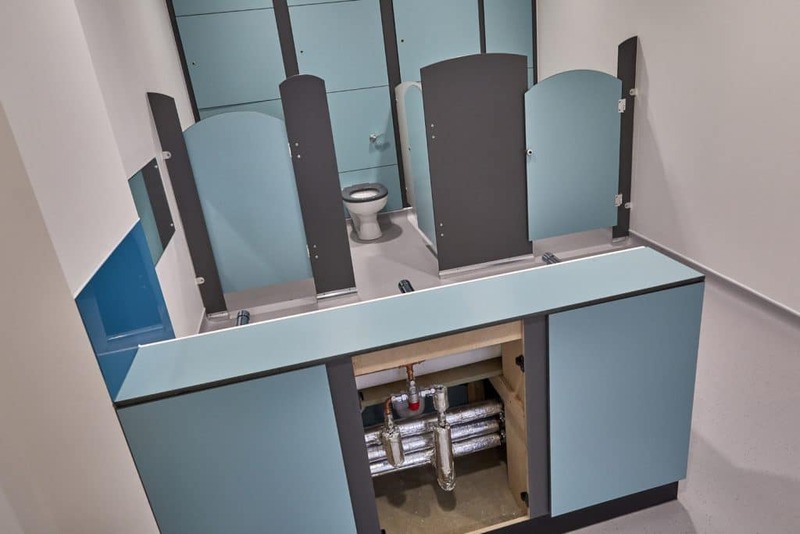 The project brief was to design and manufacture a total of X washrooms suitable for Reception, Nursery, Key Stage One and Two pupils. 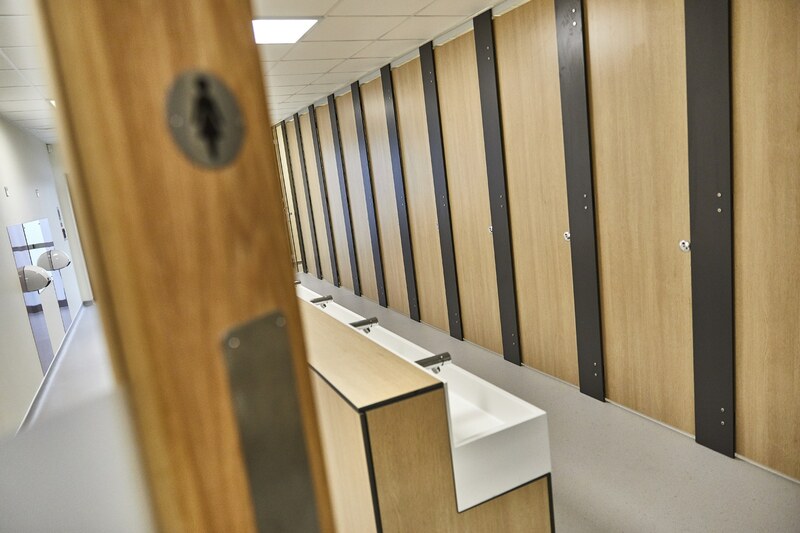 The project needed full washroom consideration with cubicle systems, vanity units, hand wash troughs and duct systems. As the project was being undertaken as part of a brand new build, colour specifications and choices were an important design consideration. For the Nursery and Reception washrooms, Dunhams Kinder Cubicles were used. 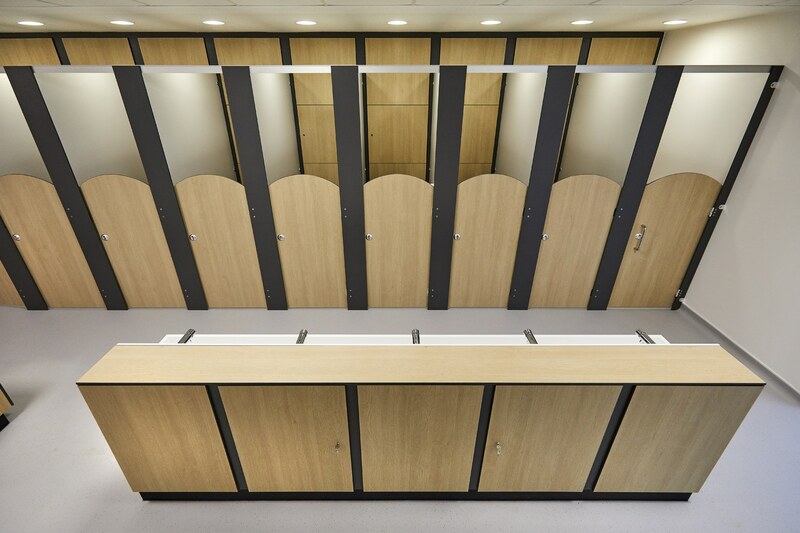 With a low level and a curved panel design, the Solid Grade Laminate cubicles (SGL) provide easy supervision whilst maintaining privacy. Cubicle requirements for Key Stage 1 were met with Dunhams Junior Altitude SGL range. This system doesn’t encroach on the student’s privacy but provides access for supervision if required. 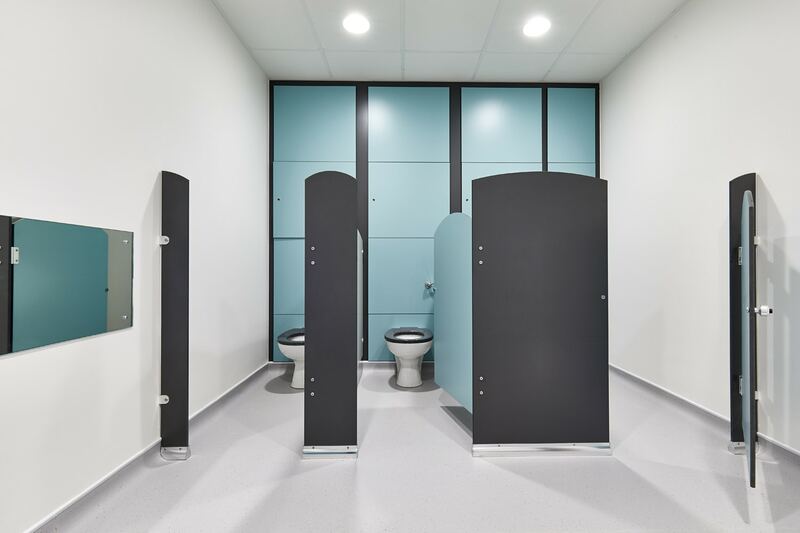 Key Stage 2 washrooms took into consideration the children’s maturity with full height Altitude for Education SGL cubicles, the solution to total privacy and security. Dunhams’ vanity units were topped with Corian handwash trough units and our Duct Plus system to cover pipes and plumbing. A key design consideration for the layout of the washrooms was the positioning of the handwash trough units in the centre of the washroom spaces. This provides the children with a gentle and appealing reminder to wash their hands. 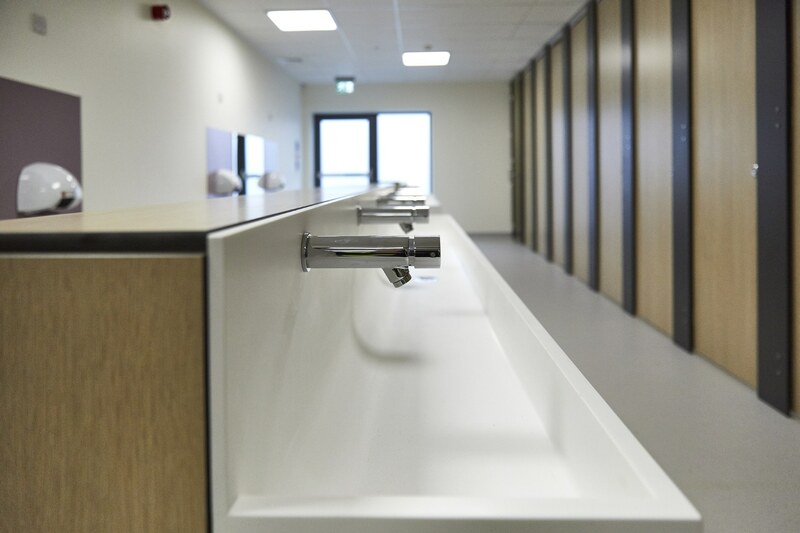 Vanity units were topped with Corian handwash troughs, which are robust, hygienic and smart. The colour choice of the sturdy SGL panels reflected the cubicle colours. Vanity units provide panelling to safely and attractively cover the general piping and plumbing which sanitary ware exposes. The design of our vanity units ensures pipework is safely and securely covered, combining appearance and safety. 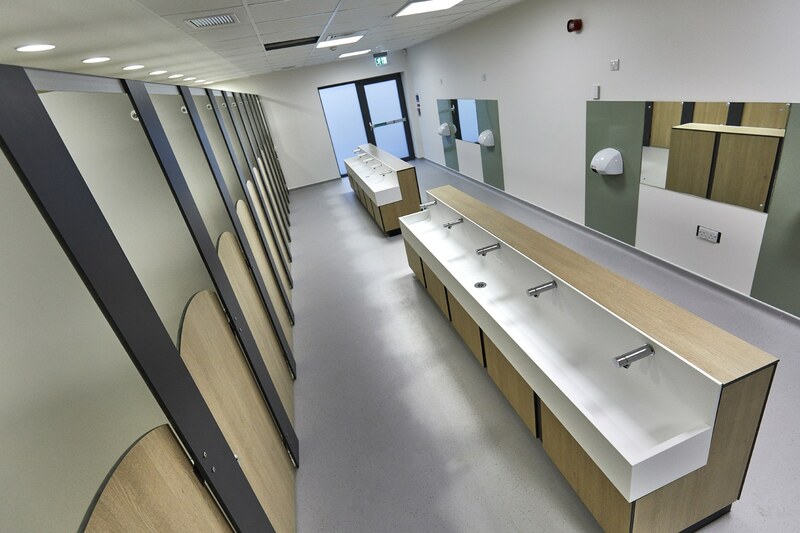 Open style handwash areas also ensure easy supervision and reduce the risk of bullying and vandalism. 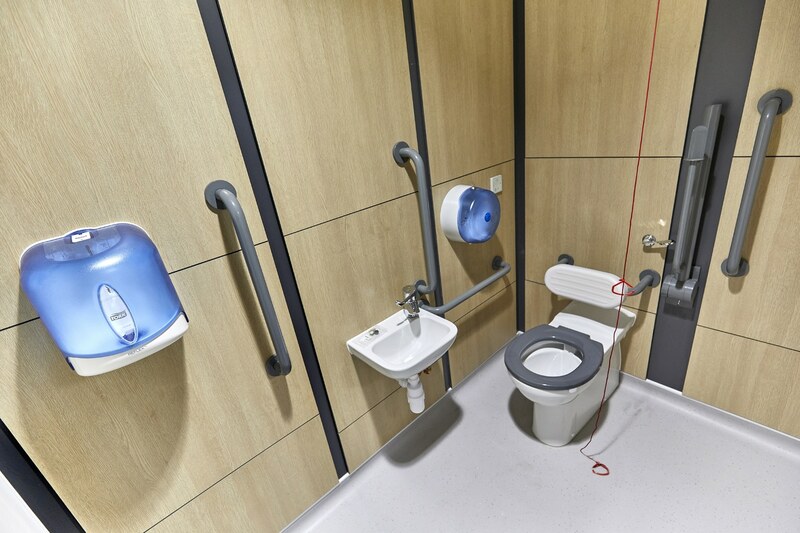 Our popular Duct Plus system was the functional choice throughout the washrooms. This provided straightforward installation for the contractors. 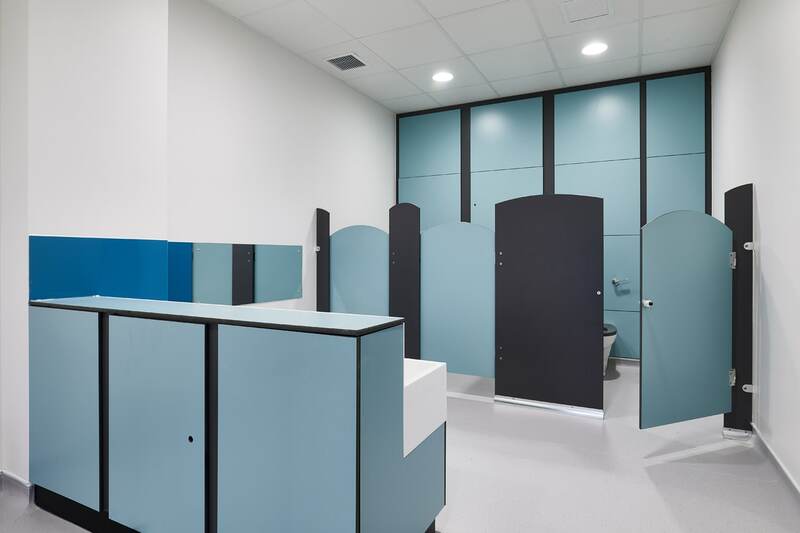 Washroom colours for this project were meticulously chosen throughout the school. 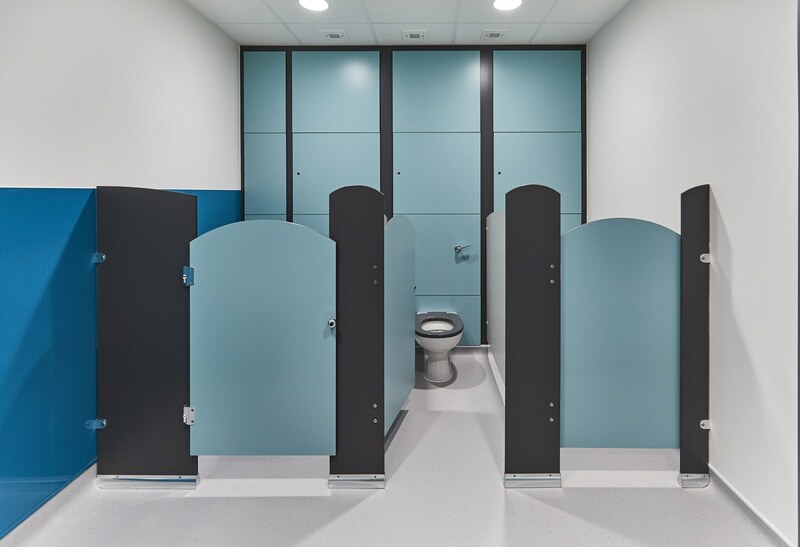 A neutral approach to colour was taken with the Nursery Washrooms, with soft ‘Jade’ doors, ‘Deep Cloud’ divisions and a hint of ‘Contemporary Grey’ included in the pilasters. This provides a colour palate which is not overpowering to the young users, but at the same time attractive, and agreeable to both adult and child taste alike. Correspondent colouring was agreed throughout Key Stage 1 and Key Stage 2, giving the school a professional feel. 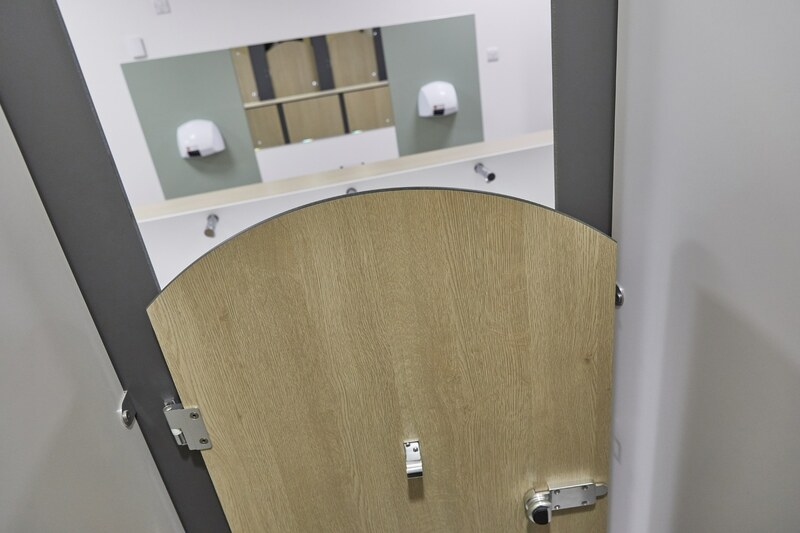 ‘Mature Oak’ doors were chosen to assist with neutral theme of ‘Cloud’ divisions and ‘Contemporary Grey’ pilasters were carried throughout the school, adding to the sophisticated feel. Working on a similar project? 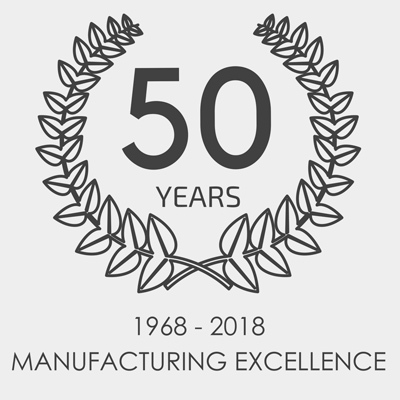 Contact our expert consultants today for a quote!